I was always quite sporty and ran and played football at quite a decent level when I was young. However, as I got to around 13/14 I got interested in cycling (thanks to my older brother) and soon got into riding about with my brothers and friends. We’d ride out to Pickmere Lake and hire a boat then ride home afterwards. We’d also visit distant friends and relations (well we thought they were distant at the time but they were only 30-40 miles away!) and would have to get a lift home due to it being so late and us being so knackered! I soon joined the Leigh Premier Road Club, where there were quite a few of us young ‘uns statring out, and the day trips gradually got more serious and lead to touring and racing. I have a poor reputation for bicycle maintenance (particularly on my winter training steed) and it is not uncommon for me to return from trips away with my bike held together by toe straps and cable ties whilst creaking along! My navigational skills also leave something to be desired and a 4-5 hour ride led by me will usually turn into 5-6 hour ride! Past – Stephen Roche & Robert Miller. I love cars and if I wasn’t into cycling (and didn’t have a company car) I’d probably indulge myself further in that respect. I try and avoid walking anywhere but sometimes it’s just unavoidable!! I am known for my exuberant dancing style and my signature dance move ‘the running man’ which generally makes an annual appearance at the work Christmas party! A sneaky tin of red bull when nobody is looking!! On the road – Sprinting past Charly Wegulius for my first road race win. Winning an elite road race at Ulverston, coming 2nd overall in the Tour of the Borders, 5th Overall in the Bikeline/Mersey 2 day and being an elite category rider for 3 seasons. In time trialling – being the WCTTCA 10 & 25 mile champion and placing in the top ten in the national hill climb championship 4 times. 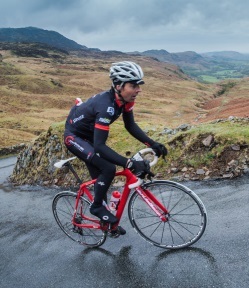 Hard to say…I always liked the Tour of Snowdonia! I am a big fan of food and this is a difficult one to narrow down but it would probably be an spicy, Italian dish! American Flyers, of course! Best film ever! Angliru, Northern Spain, on a compact chainset this time!! I can think of more ‘worst’ decisions to be honest!! With regards training, there’s no substitute for riding the bike!